All levels, all ages, all people are welcome to join. Joaquin will combine elements from Yoga and Acrobatics. We will explore partner yoga, assisted inversions, strength drills, basic flying and lots of PLAY, loads of laughs. No yoga experience required, no partner needed. Come support and be supported. Joaquin De Teresa Joaquin is a gentle spirit with a fiery soul. His yoga teaching is rich in intention, with his work seeking to connect worlds, share healing and facilitate in growth experiences. An intuitive healer, Joaquin is a Yoga teacher certified by Acroyoga and Yoga Alliance. Joaquin’s work brings people back into their body, helping people move better, and be present. His studies include Thai Massage, Yoga, Acroyoga, meditation, spa therapies and indigenous medicine. Joaquin has travelled the world extensively studying and teaching with some of the worlds most respected teachers. Joaquin presents his yoga and acroyoga workshops at Music and Arts festivals around the world. This will be a playful exploration of the physical body in motion and its connection with the subtle mind and higher self. ShivaPriya firmly believes yoga is for everyone, and so teaches in an open-level class style presenting an opportunity for the individual student to deepen each asana (posture) based on his/her level of practice. Beginners and advanced students alike will enjoy this class, which includes pranayama (breathing exercises) to invigorate the vital energy, surya namaskar (sun salutations) with variations to warm up, stretch and tone the body, a logical sequence of asanas presented with variations for all levels to strengthen the body, and a guided final relaxation and yoga nidra (yogic sleep) to purify the mind. Students will come away feeling refreshed, recharged - and happy! 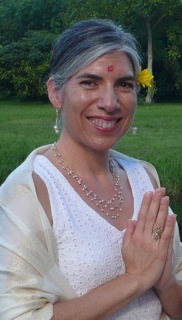 ShivaPriya has been teaching in South Florida for 4 years, and is an RYT500 certified Sampoorna Yoga Archarya (professor of yoga). For more information visit www.SampoornaYogaMiami.com and www.yogihari.com. This a special class to understand the Vinyasa flow, how mystical it can be when you really connect the breath and movement. Enjoy a series of asanas that will make you open your nadis and dive deep with your into yourself. All levels welcome. Bring your own yoga, towel, water and a open heart as we move into blissful Jay uttal mantras. In this demonstration, Dashi Chu Kocica will explain what Qi (chi) is and how it relates to your health, then share her story of healing a partial hearing loss in 1997 at the world's largest Qigong hospital in China.